This dish reminded my husband of one of his favorites growing up. It will certainly be a staple in our house. So easy to make and absolutely delicious. I love it when dinner can be on the table in under 30 minutes! This will serve 4. Cook spaghetti according to directions. Drain and set aside. While the pasta cooks, in a large high sided skillet, sauté onion in butter until translucent then whisk in the cream of mushroom. Add the chicken stock and cheese. Keep stirring until all the cheese has melted. 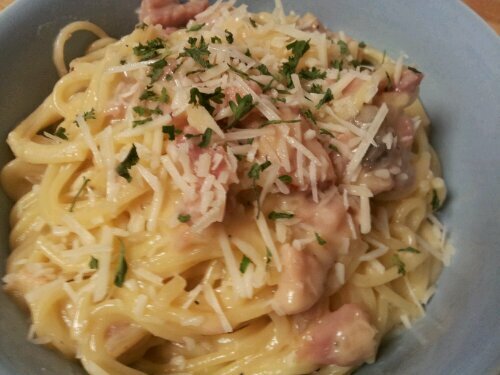 Add in the ham and pasta. Stir until heated through. Serve topped with parsley and additional Parmesan cheese. Sometimes, even adults want that great kid’s standby of Mac-n-Cheese. This version just makes eating it look, and taste, a bit more gourmet! Pre-heat your oven to 350°. Cook bacon if you don’t have any already done up. Cook pasta according to directions. Drain and set aside. Meanwhile, cook onion in butter until translucent. Add in the flour and pepper. Whisk constantly to make a roux. Slowly add in the milk while continuing to whisk the mixture. You don’t want any lumps forming. Once the milk and butter/flour mixture has been smoothly combined, continue to stir gently until the milk starts to lightly bubble. Add in your cheese mixture of mozzarella, cheddar, blue… anything you’d like as long as it’s 12 ounces total. Keep stirring until the cheese is fully melted. Add your pasta in and turn off the stove. Stir well to attempt filling the pasta tubes with cheesy goodness. Transfer to a 2 qt. oven safe casserole dish. Top with bacon and bread crumbs. Bake at 350° for 30 minutes or until bubbly and slightly golden brown. I served this layered dip with tortilla chips at little man’s birthday party. Everyone loved it and we loved what little leftovers we had. 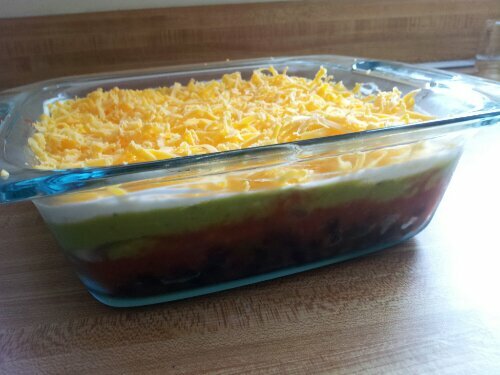 Simple really, just layer on everything in order starting with the black beans and ending with the cheese. It’s great to make ahead and store in the fridge. My husband had a potluck at his work today. We signed up to bring homemade soft pretzels. They were a huge hit! We paired them with pretzel cheese sauce, made with Vermont and regular cheddar this time, and horseradish mustard. Many of the guys in the office went back for a second pretzel. I’m so glad they all liked them. I got to taste some really great food that other people brought too. I expect we will have another pot luck since it was such a hit. So, how can I top my pretzels? Maybe I’ll make burgers next time. Any suggestions? This recipe is my Mom’s. I grew up eating this and it was one of my favorite meals. It brings so much comfort and it’s so healthy and cheap to make. Who knew growing up that my mom could cook such great tasting, healthy meals on a budget? I never knew then, but I’m happy to know now! The only modification I make is that I don’t use peppers (Mom would use 3 Tbs chopped green pepper), and I bump up the chips and cheese. In a high sided large skillet, cook beef and onion until meat is browned and onion is tender. Drain off fat. Stir in tomatoes, with liquid; kidney beans, with liquid; water; rice; chili powder; and garlic salt. Bring to a boil, reduce heat. Simmer covered 20 minutes stirring occasionally. Top with cheese. Cover and heat 3 minutes. Sprinkle chips around edge. Pre-heat oven to 425°. Scrub potatoes and prick all over with a fork. Wrap in foil and bake for 1 hour. Remove potatoes from oven and test that they are done (they give when you squeeze them). Remove the foil and cut a slit in the top of the potatoes. Squeeze the potato together to create a nice hole in the top of the potato. Top with your choice of toppings. We used sour cream, chives, shredded cheddar cheese and bacon!